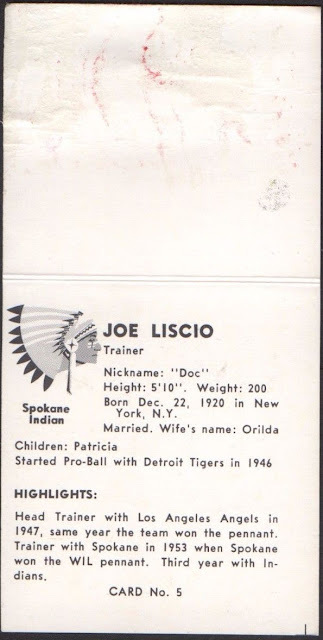 You won't find well-groomed today's guest, Joe Liscio, in Spokane's 1960 batting or pitching stats, but he still meant a great deal to their PCL title--11.5 games in front of second place Tacoma--as clubhouse trainer and planner of their off-the-field workouts. It's likely, in fact, that the Dodgers sent Liscio to AAA after spring training to help young players strengthen up for MLB debuts or guide older guys through rehab. Of the 30 men who played for Spokane in 1960, an amazing 23 reached the majors, a great record of success for any minor league staff. "The Phils may not win it all, but they will be excruciatingly healthy. Pass the sea kelp and give me a slug of that wheat germ oil." Darigold Farms glued singles from this 24-player set to their milk jugs during baseball season. Cards prove hard-to-find today, thanks to its small print run and regional nature. Original Darigold cards like this one include a foldable tab and prove tough to locate in today's market. Joe married another scarce commodity: "women named Orilda." Since Joe's a trainer, I borrowed a back scan from Check Out My Cards to show how the set handled player stats. 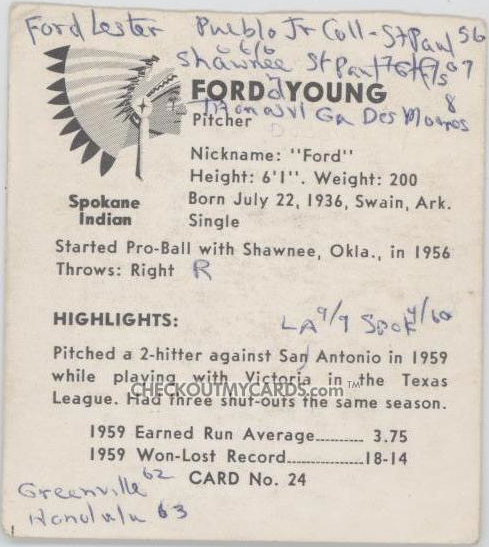 Ford Young never did reach the majors, but at least one fan kept close track of his goings-on. They (correctly) added both his middle name (Lester) and earlier minor league seasons with Shawnee, Thomasville, and Des Moines (career stats). 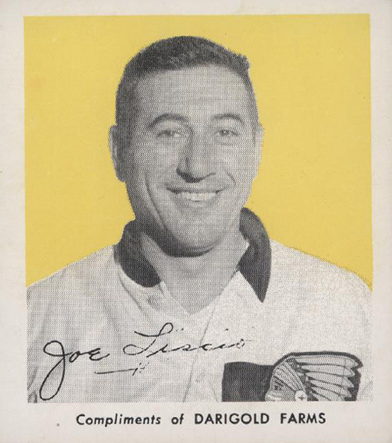 It even mentions "Honolulu '63," perhaps a team he tried out for (the Islanders), but didn't stick with. 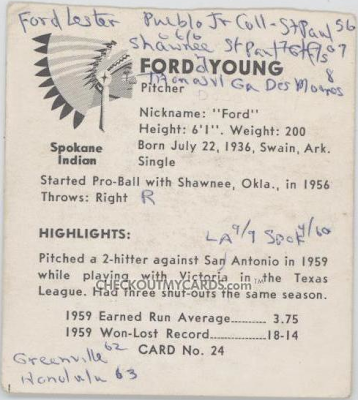 Value: The pictured low-grade Ford Young's listed at $60 on Check Out My Cards. The only #5 on eBay's listed for $120, which strikes me as optimistic (and it's been sitting there for awhile). The latest SCD annual guide puts NM singles at $145, VG at $40. Fakes / reprints: I assume people have reprinted Darigold Farms cards, given their rarity and inclusion of eventual major league stars like Frank Howard, Willie Davis, and Ron Fairly. Since original cards had the blank tab, cutting off that tab often leaves a ragged top edge. Reprints might have a factory-cut top border.